Ever wanted to know more about how your leather was finished and what makes each leather product look and feel different than others? On this page you will learn about each product method and the process that goes into the tanning and dying of each and every Derek Alexander product. You will also learn about the product series that use each method. Browse the page to learn of all the methods, or select a specific method from the list below to start there. Drum dyed cowhide is really Derek Alexander’s signature leather. The process involves putting up to 500 hides in a closed rotating drum. In addition to the hides, smooth stones, vegetable dyes and tanning agents are added to the drum. The tumbling of the leathers with the stones takes the stiffness out of the leather, resulting in a soft touch. This process also results in a good dye penetration of the leather. The absorbsion of the color is important because scratches incurred with use will not show as much as in leather tanned in a normal fashion, which involves either the rubbing or spraying of pigment on the leather. A wide variety of styles in drum dyed cowhide; our first series and still the largest collection in Derek Alexander. Designs in this series are classic and the bags feature pockets and organization. A retro series inspired from the 60’s and 70’s known for its soft touch, weave, and outstanding whipstitch details. This leather has been ‘drum dyed’ and natural vegetable oils derived from certain plants or woods are used for coloring and treatment in the drum. The finished product is referred to as a ‘Naked finish.’ A generic term used to describe leather that has no finish applied to the surface. This type of tanning results in a butter soft leather that will age quicker than most other leathers. The pores have remained open after tanning allowing the natural oils from your skin and even particles in the air to penetrate and add a wonderful patina to the leather. If the customer desires to delay or prolong this natural process, we strongly recommend using our protector sprays before usage (this will not stop the aging). The Central Park series is one of Derek Alexander’s fastest growing collections. The reason for this is the leather. Top grain cowhides are milled and vat dyed. This process is similar to a drum dye tumbling. The leather ends up with a natural pebble in the finish, a great touch and wears in beautifully. New in 2009 you will find metallic colors in this collection, truly exceptional in both touch and appearance. This is a series of wallets and is the only series made by Derek Alexander that is not top grain cowhide. Top grain lamb or sheepskin is drum dyed in a process similar to the cowhide we normally use. 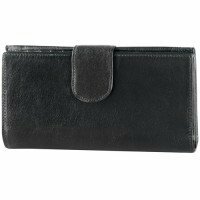 Lamb is well priced and has a great touch; we use this leather exclusively for wallets. The term Nappa leather is particularly confusing. This term is used in the industry to describe lamb and sometimes goat leather; however it is also used to refer to a combination tanning process which is how we are using it for this summary. Nappa is the most common form of tanning used in the industry. The hide is tanned using chromium salts, rolled or plated, and then pigments (the color) and other finishes are applied to the surface of the leather. A nappa finish can and will have many different appearances, textures and qualities—Ranging from smooth and soft to a pebble or crock like print. The plating or rolling of this hide prior to the color application will determine the feel and look. The major advantage of Nappa finishing is that we are able to produce some wonderful vibrant colors and Derek Alexander can use full quality hides at a slightly lower tanning cost. 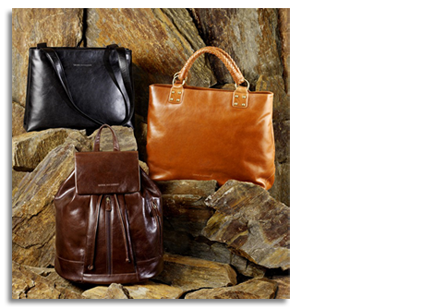 The Cierra series bags finished in Nappa have gained tremendous popularity over the past few years. The colors, pricing and functionality have all contributed to the success. The hides in this series are tanned in a combination of three different processes. They are first tanned with chromium salts (nappa process) and then milled a little (drum dye process) then finished with a light oil (oil tanned) and the result is a nice touch, soft colors only found in this series and an aging process that becomes almost rustic, much like an old bomber jacket. This leather is probably the most improved leather in our line. The current version of this leather is much more sophisticated than when it started. There are a lot of great styles in this series, don’t miss it. We put a tag on each bag to help explain the ageing and help educate the customer on what to expect when purchasing this beautiful series. The leather in this collection responds particularly well to our cleaner and conditioner; this helps replenish the oil used in tanning as the bag gets older. In this series we construct the body of the bag with our signature ‘drum dyed’ leather and the Yukon series (YK – vat dyed) leather is used for accents, resulting in a simply stunning combination. Oils (vegetable, fish or other oils) are used to cure (tan) the leather. The oil actually helps the color permeate the leather. An advantage to oil tanning is that the look is very “leathery”; sometimes almost the “Marlborough Man” type finish. Columbian leather is generally oil tanned. Oil tanned leather also stands up very well (the oil actually enhances the life of the leather); the main disadvantage of oil tanning is weight (styles tend to be heavy when empty). Derek Alexander has been working on this and our products use some very light, expensive vegetable oils in the tanning process; these special oils help dramatically with the weight. In general lighter weight oil tanned leathers are more expensive than heavier. People sometimes equate weight with cost in leather, so “lighter is better” can sometimes be difficult to explain to your customer. A wonderful Italian oil tanned leather, available only in men’s wallets, truly exceptional. A new collection for fall 2008; some exciting styling mixed with an outstanding oil tanned leather will definitely get some looks and find a home in many stores. Vat dyed is just like it sounds, the tanned leather is allowed to soak in vats with vegetable dyes and then polished. The advantage over a pigment finish is that there is more depth to the dye. The exterior look can be more or less shiny. The main difference between a vegetable dye and milled or drum dyed cowhides will be the feel, the vegetable tan will be much firmer, especially when new. The bags will, of course, soften when used. This line is known for its rich colors and beautiful polished finish. The vegetable tanning allows for a deeper look to the colors, great chocolate, red and tan lead the way. A wide variety of styles; hand bags, organizers and wallets are all available in this popular series. There are some things that the Italians just do better than everyone else. One of those things would be vegetable tanned cowhide. The leather is quite expensive so we use it primarily for wallets along with a couple of business pieces. Gorgeous….